Last month I was in Barcelona at the HP Discover conference and I followed the coverage of DockerCon a bit as well. Two conferences, the first from one of the largest tech companies on the planet, a company which inception was one of the triggers of the start of what we now call Silicon Valley. The second conference organized by a relatively new company that you could consider a far offspring of that same inception. What struck me was how similar they both are in their focus on open source ecosystems (e.g. OpenStack, Cloud Foundry, Docker). But what really excites me is their similar journey towards a world with more deployment automation and higher levels of abstraction. Because in a world where every company needs to become a software company in order to survive, we need to become smarter in how we deliver that software. Before diving into the exciting world of smarter and rapid application delivery I want to explain in a bit more detail what I mean with “higher levels of abstraction”. With a layer of abstraction I mean an additional layer of software that hides (part of) the details and complexity of the underlying system by automation. Let’s have a brief look at examples from both HP and Docker. The following table shows the “cloud” stack of both companies. HP is investing a lot in their Helion Cloud and they provide two layers: HP Helion Openstack and HP Helion Development Platform. The first focuses on software-defined infrastructure, the second is based on Cloud Foundry and abstracts infrastructure while shifting the focus to application deployment and operations. The application containers in the Helion Development Platform are actually Docker based. Docker (the company), in its search to monetize its open source success, is quickly moving into the PaaS space as well with their recent announcement of Machine, Swarm, and Compose. They will increasingly compete with Cloud Foundry in the near future, although there is a substantial gap to overcome as PaaS is much more than just deploying app containers. Although a lot of attention is going to the aforementioned cloud layers, it doesn’t stop there. We should go beyond just optimizing how we deploy and operate applications. In my opinion the PaaS world is lacking a vision on application development. There are some hopeful signs, though! Triggered by Salesforce’s pivot to modern applications, Forrester created an overview of how five major cloud platforms serve the different developer persona . The next table shows how, according to Forrester, the “DevOps” persona is served by Infrastructure-as-a-Service (IaaS, or: the Software-Defined Datacenter). The “Coders” mostly interact with the Platform-as-a-Service (PaaS) layer, and then there is a third layer for “Rapid Devs”. The layer that focuses on “Rapid Devs” adds an additional abstraction on top of (foundational) PaaS by automating big parts of the entire application lifecycle in addition to deployment. Among analysts as well as in the market there is a growing interest for this layer. Gartner states: “… by 2018, more than half of all business-to-employee mobile apps will be created by enterprise business analysts using codeless tools”. This layer goes by different names, I often call it Model-Driven PaaS, but it is also referred to as High Productivity PaaS, Rapid Application Delivery (RAD) PaaS, or low-code platforms. A year ago I posted my attempt to categorize the cloud landscape I used the Model-Driven PaaS name and stated that it was focused on the “Business Engineer” persona. I have to admit that I have a growing appreciation for the “Rapid Dev” name that Forrester gives these people instead. The vendors reflected in the above table and mentioned in the Forrester research report all have very early offerings, but it is promising to see traction in this area! However, as regular readers may suspect by now, I don’t think this Model-Driven PaaS market is so immature as it maybe seems based on the previous. There is a mature Rapid Application Delivery platform that has always been focused on rapid devs: Mendix. We (yes, I work for Mendix) have been running on OpenStack for years, and with the more recent introduction of Cloud Foundry we immediately started to investigate how to leverage it. By now we are a silver member of the Cloud Foundry Foundation. With our integration with Cloud Foundry we provide our customers the flexibility to run their applications everywhere (any Cloud Foundry distribution, any IaaS). It also enables us to focus on our unique strength: Rapid Application Delivery through Model-Driven PaaS. Just two weeks ago Forrester published their Wave for Enterprise Public Cloud Platforms for Rapid Developers, in which they declare Mendix a leader in this space. 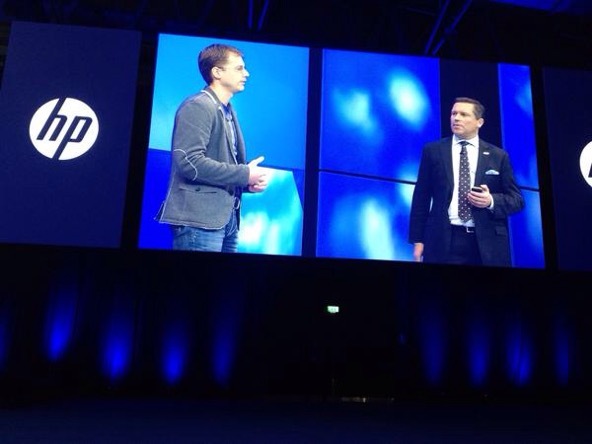 I started this post by talking about the HP Discover conference, I wasn’t there without a reason. During the keynote of Marten Mickos (SVP, HP Cloud) we announced our partnership with HP and the integration of our product with HP Helion. With Mendix as a partner, HP Helion now serves all three of the developer personas as depicted in the table below. Will App Delivery PaaS make cloud more relevant to the business?